The number has grown 40-fold since 2016. BRITISH DESCENDENTS OF refugees who fled Nazi Germany, including many Jewish families, are racing to have their German nationality restored so they can remain EU citizens after Brexit, official data shows today. 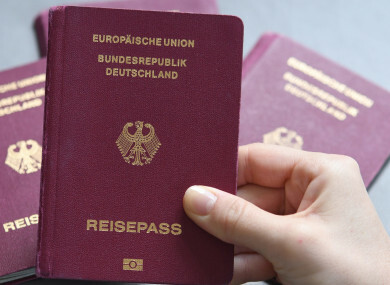 The number of Brits applying for German passports using a special legal provision that aims to make amends for Nazi-era persecutions, known as article 116-2, has soared nearly 40-fold since Britain voted to leave the bloc in June 2016. Germany received just 43 such passport requests in 2015, but that jumped to 684 in 2016 — nearly all of them submitted after the Brexit referendum. Last year, the number leapt to 1,667 requests, according to figures released by the German interior ministry in response to a parliamentary question. Under article 116-2 of the German constitution, former Germans who lost their citizenship on “political, racial or religious grounds” between the day Adolf Hitler became chancellor on January 30, 1933 and Germany’s surrender on May 8, 1945, can ask to have their citizenship reinstated. According to the German government, the group “mainly includes German Jews” and members of critical political parties at the time. The legal provision is also open to descendants of those who were persecuted and sought safe haven abroad. Other EU countries have likewise seen a surge in passport applications from British people hoping to retain the same rights post-Brexit, including being able to live and work as locals in any member state. France has seen an eight-fold increase in Britons asking for citizenship, from 386 in 2015 to 3,173 in 2017. There was also a spike in the number of British becoming Irish citizens, figures showed in September. “In 2014 just 51 UK citizens became naturalised Irish citizens. In 2015 this increased marginally to 54 before nearly doubling to 98 in 2016, the year of the Brexit vote,” said Senator Neale Richmond. Email “Number of British descendents of WWII refugees applying for German passports has soared”. Feedback on “Number of British descendents of WWII refugees applying for German passports has soared”.